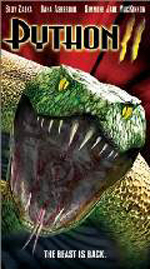 The original Python (2000) was an OK giant-snake flick, cheap and made by a first-time director, but not without merit -- it had some good giant-snake scenes and generated decent levels of suspense. The plot was a paranoid body-count exercise, of course, seguing into desperate attempts on the part of the main characters to kill the titular genetically enhanced CGI perp. One of these characters was local cop Greg Larsen (played by William Zabka) -- who survives that particular scenario and is hence destined for Great Things. Python II (or Python 2 or even, as the Region 4 DVD case would have it, the totally inaccurate Pythons II) is an even-cheaper TV sequel in which Greg Larson (still played by Zabka) pursues his destined Greatness -- now as a CIA operative who has been sent into Russia "somewhere" to fetch the US military's prize serpentine weapon because he's a default "expert". Another plane carrying the giant python-in-a-crate has crashed en route to wherever and the Russians have retrieved the cargo and secreted it in an isolated military establishment. What Larson and his goons don't know, of course (but might have guessed), is that the Russians have already opened the crate and have therefore been turned into bloody python chow. The other main characters are a husband and wife team who have a Big Truck and run a haulage operation "somewhere in Russia". They are hired by Larson to go pick up the "cargo" and before long find themselves dodging giant snakes in an underground complex, as one-by-one the slow-mo cannon-fodder lackeys get eaten and the Truth is revealed. Overall, critical response to this film (such as there is) has not been kind. In fact, many reviews are downright sarcastic. Such lambasting is unfair, I think. OK, Python II was clearly made on a very low budget someplace where production costs could be kept down, and the CGI snake is not a premiere example of contemporary visual technology. But, for me at least, the film works quite well. I wasn't expecting a lot, yet it kept me interested. Contrary to some reviews that react, I think, to a conscious or unconscious belief that lack of expensive bells-and-whistles equals bad and therefore justifies contemptuously criticising everything from the visual effects to the acting and the script, the film does generate suspense if you let it, the direction is fairly tight and the actors handle themselves well. The effort on display here is not a disgrace. OK, the giant snakes rarely "sit" in their scenes very convincingly. But the film-makers recognise that there are unavoidable technical problems in creating flawless CGI monsters on a limited budget. As a result, they keep the SFX scenes fast and furious and to a minimum -- with just sufficient full-on glimpses of the snake to keep us reasonably happy. Actually, adopting a tactic of treating the snake in a visually elusive manner, albeit enforced by economic strictures, makes for some genuine suspense. Meanwhile the writing is OK, character interaction is effective, the back story (about how the haulage guy is a disgraced baseball pitcher in exile) is only slightly silly, Simmone Jade Mackinnon is gorgeous, and the snake races through tunnels with vim, being nastily predatory and spitting toxic venom with glee. A decent effort. Reasonable actors. Action. Suspense. Giant snakes. What more can you expect for a couple of bucks?